What was the largest home built in Santa Rosa? It wasn’t Mableton, the McDonald mansion; the elephant in our living room was the Riley house at 426 Mendocino Avenue, with its stately house and gardens that filled most of the block between Fifth Street and (what’s now) Seventh Street. * At about 16,000 square feet, it was so big that when it was remodeled into a hotel there were thirty guest rooms. The size of the house was difficult to judge from the street because the building was secluded by mature trees, as footpaths wound around bushes and flower beds. A postcard was sold of the Weeping Lebanon Cedar, and photos from the early Twentieth Century of blooming cherry trees and roses can still be found. Whomever gardened these grounds had the greenest of thumbs (having a 600 sq. ft. greenhouse at the back of the property didn’t hurt, either). It’s been guesstimated that the house was built in the 1870s, based upon its Second Empire style with mansard roof and elaborate dormer windows. But it’s also possible that this was an exterior remodel of an older and much simpler house. The 1876 Bird’s eye view of Santa Rosa – which is pretty reliable in showing approximate sizes and shapes of buildings – has a two-story house with about the same footprint in that location. The late 1870s was also an era when there was a fad for slapping a modern Victorian facade over simple, classic designs, and adding a mansard roof was a popular way to simultaneously update the look and gain another story. Many such examples can be found in the contemporary how-to book, “Old Homes Made New,” which has before-and-after drawings – although most of the “improved” homes look like they were designed for the Munsters. We also don’t know who first owned the house (someone with title search skills could probably answer that), but the 1880 census shows an extended family of eight living there with two servants. At home were Mr. and Mrs. Riley and their two children as well as Mrs. Riley’s parents and their two other children. This was probably a confusing family to meet for the first time; Mr. Riley was older than his mother-in-law by about three years, and Mrs. Riley was young enough to be his daughter by a quarter century. Mr. Riley was Amos W. Riley, a businessman of great success. He and his partner founded a chain of mercantile stores from Sonoma to Humboldt counties, then concentrated on raising livestock with large ranches in Nevada and Oregon. Amos Riley died in 1908 at age 83 and like everyone else mentioned here, is buried at the Rural Cemetery. After the earthquake and the death of mother-in-law America, Amos moved in with his daughter, a block away at 565 Mendocino Av (currently a parking lot), and the Riley family leased their old home to developers who remodeled it into the Hotel Lebanon. The public had its first chance to get an eyeful of the gardens – which, I suspect, had been created and always under the care of the late America Thomas – and it’s easy to imagine that the beautiful, fragrant hideaways immediately became a favorite haven of young people in love. 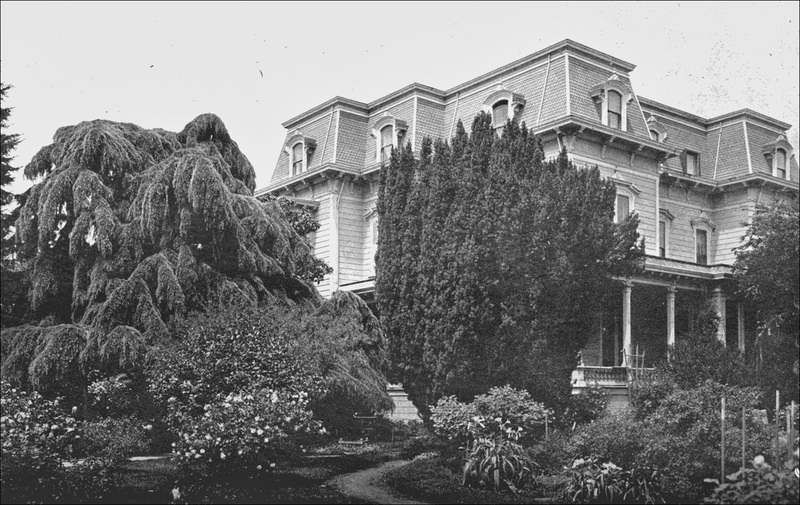 Then came 1909, when we find Ernest Finley, editor of the Press Democrat and president of the Chamber of Commerce, doing backflips of joy over the proposal that the old house could become the town’s city hall and the beautiful grounds be declared Santa Rosa’s first public park. In the first decade of the Twentieth Century, Santa Rosa was a place where grand ambitions rose and just as quickly died, mostly because of a lack of political will to raise money to pay for public improvements. New post-quake federal and county buildings (the post office and courthouse) were in the finishing stages in 1909, but there was no city building even planned. An architect-designed city hall and firehouse was abandoned because the local banks didn’t want to loan money to the city. Plans for a city water park were thrown out after the quake, and the current mayor didn’t even try to make good on election promises to transform the tenderloin district into a park that families could enjoy. The Press Democrat backed the idea of buying the Riley property enthusiastically, given that it would provide an instant solution to both park and city hall needs. Acknowledging that a 30-room joint complete with dining hall might be a trifle too roomy for the administrators of a small farm town, the PD mused that the mansion could be later torn down or moved and a smaller office built on the corner of the property. The paper was so gung-ho on the concept that it did something unusual: It reprinted a condensed version of a story that had appeared the previous week, this time accompanied by the photo at top that filled a third of the page. And predictably, the grand ambition fizzled. No bond measure was placed before the voters. After its time as a family home and hotel/restaurant, a third act awaited the grand old place. The Odd Fellows Lodge no. 53 bought the building in 1920 and remained there until 1955, when its new building was dedicated on Pacific Avenue. The Lodge has a few exterior photographs from its tenure, but alas, no interior pictures are known to exist. As the Riley Mansion began in mystery, so it ended; the year of its demolition is not known. Farewell, majestic old manse; too bad we didn’t at least have the decency to save the trees, which can live for more than a thousand years. * The 1967 Seventh Street Realignment Project merged the old 7th street (west of Mendocino Av.) with Johnson St. (east of Mendocino Avenue). A couple of odd twists and turns were added where no road had existed previously to make everything connect. properly, and the Johnson name was abandoned. The acquisition by Santa Rosa of the beautiful grounds about the Hotel Lebanon on Mendocino avenue for a public park. together with the big building, which could be used as a City Hall, has been a subject of discussion on the part of a number of citizens, particularly since it was learned that the property could be purchased for the same figure as that contemplated in the bond issue for the erection of a municipal building, $40,000. For a long time the acquiring of a park for the City of Roses has been the fond dream of the Woman’s Improvement Club and advocated by scores of the men of the city as well. Already the suggestion made for the purchase by the city of the Hotel Lebanon property, owned by the estate of the late A. W. Riley, for the purposes mentioned, has enthusiastic supporters, and now that the Press Democrat gives it publicity it is expected that the plan will be discussed freely. For years the Riley property, with the spacious residence and picturesque surroundings, has been one of the show places of Santa Rosa, and in times past it has often been coveted for park purposes. 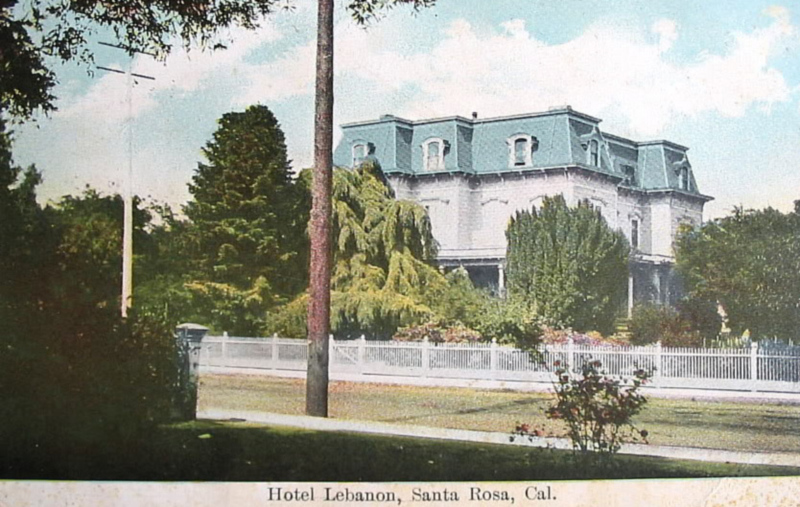 In the grounds are trees and shrubs gathered from many climes, and when the family vacated the place and after the big disaster it became the “Hotel Lebanon,” it was so named from the beautiful Cedar of Lebanon which was brought from the Holy Land many years ago and planted in front of the mansion where it has grown and developed ever since. Recently several thousand dollars was spent on the building prior to its reopening and for some time to come it could be used for municipal purposes, there being many spacious rooms available for meeting places and offices. Later on, it is suggested, the building could be sold, and a city hall built, either back against the Native Sons’ building, or else in the center of the park. Another important consideration in the connection with the purchase of the Riley place for a public park is that it is centrally and ideally located and the park is already there–the grounds are laid out and the trees, shrubs, and flowers are already growing luxuriantly. The hotel Lebanon will close its doors at the end of July, and its manager, B. C. Cosgrove, will retire temporarily from business. This is being done on account of the state of his health. All the furniture and fixtures are for sale. The Lebanon was built by the late A. W. Riley and occupied by him and his family for many years as a private residence. After the fire of 1906 it was made a hotel and for a considerable time it was the only hostelry in Santa Rosa and had a big run. When Mr. Cosgrove too charge he had it completely renovated and made many changes in its arrangement. The hotel is situatied almost in the business section of the city and the garden and grounds surrounding it are hardly equaled in this section. It has been equipped more for a tourist than a commercial hotel. The publicity given the project to buy the Hotel Lebanon and grounds for a public park in the Press Democrat on Thursday morning excited much interest and the matter was much discussed pro and con during the day. It was expected that the suggestion would give rise to considerable talk. To many people it was a hearing of the matter for the first time; others had hoped that just such a plan as put forward would some day become a realization. Thursday a Press Democrat representative interviewed a number of well know citizens on the subject and found that a majority looked with favor on the scheme. Others desired a little more time for consideration. Still others favored the acquisition of the beautiful grounds as a park but opposed the use of the building as a city hall. In regard to the latter idea it was not the intention of the citizens who first suggested the purchase of the property by the city that the building should be a permanent City Hall, the plan being that it could be used temporarily. “By all means I am in favor of the city purchasing the Hotel Lebanon property for a public park; lets have it all park, however, and sell the building and move it away,” was the reply of one citizen asked for an expression. “It is a splendid idea,” said another. “I think that the bonds would be more likely to carry for the purchase of the Riley property for a park than for the erection of a city hall on the old lot,” he added. There are a few of the replies to queries put by the interviewer to men of affairs in Santa Rosa. A number of women were also seen. They are all in favor of a park and for several years the securing of a park has been the fond hope of the Woman’s Improvement Club. There is no doubt that the entire club membership will endorse the suggested acquisition of the Riley property. Then, of course, among the number discussing the matter Thursday were men who did not see the wisdom of taking a hasty step in the matter. Then there were those, you could count them on your fingers, happily, who raised their voice in protest against the idea of a park or city hall at all, men who are nearly always in the front rank of the “knockers” and to whom a city’s progress means naught. But the concensus [sic] of opinion gained Thursday is heartily in favor of the public park, particularly such an ideal place as can now be secured in the purchase of the Riley property. Many people passing along Mendocino avenue Thursday stopped to look and admire and talk about the delights of the trees and shrubs, the lawns and walks. Others brought visitors to the place to show them. It was a day of additional admiration for the beautiful place on Mendocino avenue which public spirited citizens suggest should be acquired by Santa Rosa as a public park and city hall.